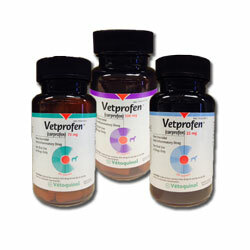 Vetprofen contains carprofen, the most widely used and clinically proven NSAID in veterinary medicine. Carprofen, like other NSAIDs, works by blocking the production of prostaglandins, the body chemicals that cause inflammation. Most dogs respond quickly to carprofen and become more active and mobile within just a few days of treatment. Always provide Client Information Sheet with prescription. Carefully consider the potential benefits and risk of Vetprofen and other treatment options before deciding to use Vetprofen. Use the lowest effective dose for the shortest duration consistent with individual response. 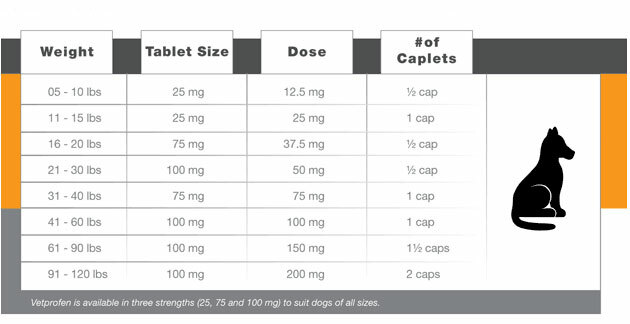 The recommended dosage for oral administration to dogs is 2 mg/lb (4.4 mg/kg) of body weight daily. The total daily dose may be administered as 2 mg/lb of body weight once daily or divided and administered as 1 mg/lb (2.2 mg/kg) twice daily. For the control of postoperative pain, administer approximately 2 hours before the procedure. Caplets are scored and dosage should be calculated in half-caplet increments.